The strange tale of the mystery burglar known as the North Pond Hermit. Strange things were happening to the residents of towns near North Pond, Maine, USA. They were unnerved, confounded and afraid. It was the late 80’s, and food started to go missing from their kitchens, batteries and watches disappeared, little things weren’t there any more. Unusual robberies started to become a regular occurrence, however it was never valuable items stolen. Propane gas tanks from the barbecue, winter jackets, cooking pans, meat from the fridge and sweeties – not your usual haul for a burglar. A shadowy figure became legend, and thus began a 27 year period of fear for residents. The police were powerless, as no clues had been left by the intruder, no one had made any sightings. They tried to change the locks, install alarm systems, even desperately left notes asking what the burglar wanted so they could leave it out for him, but nothing stopped the break-ins. 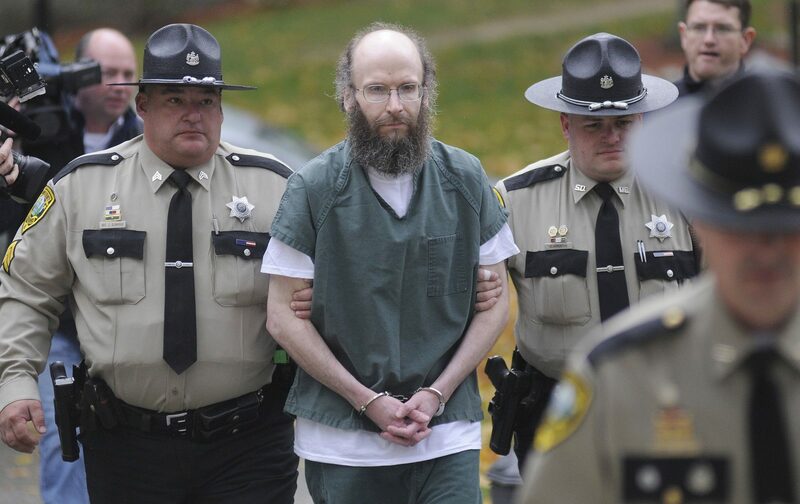 As the incidents continued throughout the 90’s and 00’s, he was dubbed the “North Pond Hermit” and by this time he had broken in to more than 75 homes. Some people thought the hermit was a ghost, a story that forgetful neighbours conjured, and his infamy grew and the tale of the hermit transpired to myth. In the dead of the night during 2013, the hermit was raiding the Pine Tree camp kitchen when Sergeant Terry Hughes, who had installed a military grade motion detector, was alerted to his presence. He wanted to once and for all catch the hermit in the act. When the detector triggered the alarm, Hughes dashed there in his truck, hoping to apprehend the elusive phantom before he disappeared into the dark of the night. What waited for him at the camp was the biggest surprise of his life, and Hughes cracked the mystery, finally discovering who had been creeping around and quietly terrorising the neighbourhood for the past 27 years. The man was pale, wearing out-of-fashion glasses and ski hat, but with surprisingly new trendy hiking jacket and solid boots, and had no ID. At first, he wouldn’t speak to the police, and when he did, it was jolted and didn’t come naturally. He finally started to open up and revealed himself to be Christopher Knight. 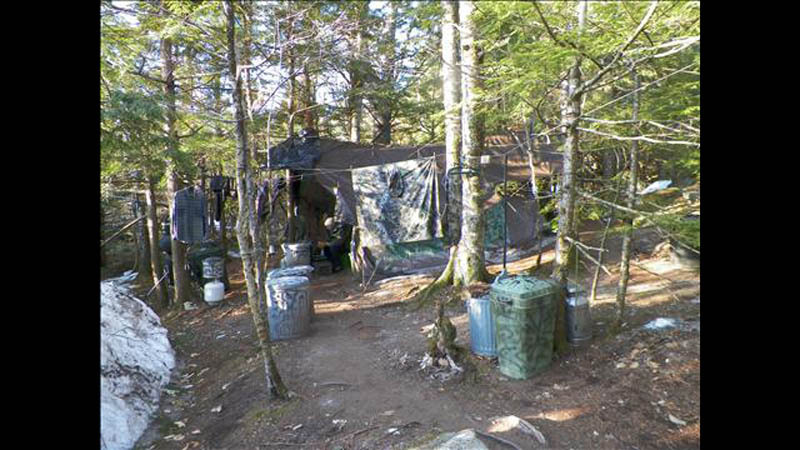 The camp where North Pond Hermit Christopher Knight lived. The story that finally came out is almost too extraordinary to believe. One day in 1986 Chris drove into the woods, he abandoned his car, and started living there in a tent, building a substantial camp over the years. He camouflaged his tent with tarpaulins, made a separate washing and cooking area, and had even hauled back a mattress and pillows. He had been incredibly careful to never leave a trace, not even a footprint in the winter snow, and had planned and stockpiled food to last throughout the long, harsh winters of Maine. Many people didn’t believe it would be possible to survive in the woods through winter, which often reached sub-zero temperatures with heavy snow. Chris trained himself to sleep at 7.30pm and wake at 2am, so that he wouldn’t accidentally freeze to death in the coldest part of the night. But all that ended when he was caught red handed. He was taken to jail, and although he admitted to about 40 robberies over the 27 year period, it is estimated that in fact it’s closer to the 1000 mark. All he wanted was to hide away, forever, in the woods. Part myth, part legend, the last true hermit ended up behind bars, surrounded by the people who he had worked so hard to avoid. Now released from jail on probation, he is able to return in part to his hermit life, and stay out of the limelight.